Tabriz Is one of the largest cities in Iran with an estimated population of 1.5 m, located on the intercontinental highway in vicinity to the Republics of Azerbaijan, Turkey and Armenia. Marco Polo, who traveled thorough the Silk Road and passed Tabriz about 1275, described it as “a great city surrounded by beautiful and pleasant gardens. It is excellently situated so the goods brought to here come from many regions. Historical city of Tabriz or “Tauris” as Europeans would call in old times is widely believed to be one of the most ancient cradles of civilization in Azerbaijan and Iranian plateau. It was the capital of Atropotene named after Atropates, one of the generals of Alexander the Great. Meadow land and fertile grassy valley bottoms such an environment fosters a wide range of human response, pastoralism and settled cultivation of barley, wheat, vegetables and fruits. Some of the more sheltered valleys a southern aspects are warm enough in summer to allow cultivation of rice. 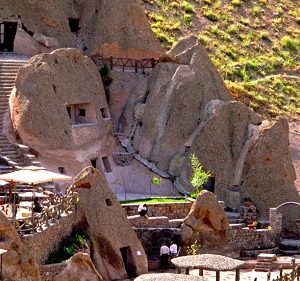 Human groups too are varied in the West live groups of Kurds and Lurs, with a few Armenian still, and toward the east numerous Baktiari and a few Qashghai. As compared with this region, greater accessibility and openness for travelers have made the Karun basin an easier route way through the central Zagros. We know from the discovered historical documents that the name Tauris for the first time has been mentioned in an epigraph inscribed on an old stone tablet considered as belonging to Saragon (II), king of Assyria (714 BC). In this ancient inscription, the king reports of a strong castle called “Tauroei”. Today most archeologist s and historians believe this castle was situated on the site of the present city of Tabriz. The music and folk songs of Tabriz are popular and traditions have a long history among its people. The handicrafts in the Bazaar of Tabriz and in particular the Tabriz rug is famous worldwide. There is an archeological and handicrafts museum in which antiquities from Azerbaijan and other areas are on display. A place for Pilgrims and art lovers. Masjed Kabood meaning the Blue Mosque or sometimes Jahanshah Mosque is one of the monument built in the city of Tabriz in the second half of the ninth century of the Islamic calendar. Masjed Kabood is famous for its beautiful turquoise dome and the vivid cobalt-blue tile-mosaics, often overlaid with gold, which decorate its interior and exterior facades. The mosque is sometimes referred to as “turquoise gem of the world” or the “turquoise gem of Islam”. The tile work of the mosque, a mixture of colors and innovative figures and designs, indicate the greatness and glory of its unique architecture. 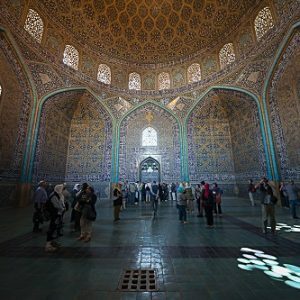 The interior of the mosque’s shabestan – area for nocturnal prayers is decorated with white, turquoise and azure, flowers and bushes or Quranic verses written in the Thuluth script, all of manifest beauty. It Is as old as the city itself linking the West to the East, from its very inception the bazaar has been a center of trade between Asian and European countries. Today when you enter the bazaar, it is as if you are taking a step into a city which travelers have described as large and graced with beautiful bazaars abounding with goods. 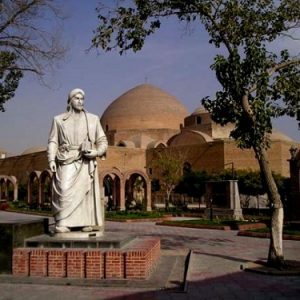 The Moroccan traveler Ibn Battuta during a visit to Tabriz described its bazaar as one of the best of its kind in the world. The bazaar of Tabriz is a masterpiece of Iranian architecture. A network of streets covered with vaults and domes. Shops selling the same goods are group together, so that there you will find a spice bazaar, a leather bazaar, a metal work bazaar and a copper bazaar etc. 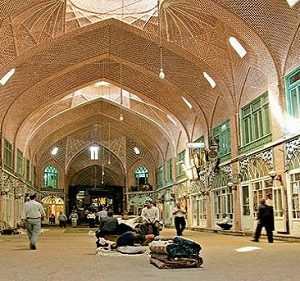 The famous areas of the Tabriz bazaar include “Bazaar-e-Amir” the “Shoemakers Bazaar” and “Sarafkhaneh Bazaar” and “Rashteh Bazaar”. Apadana was the winter palace of Achaemenian kings that was built 515-521 B.C .Its wall is made of Brick and its columns is stone . It consists of gateway, Pavilion, Haramsara ( a place for ladies) , entertainment hall and three courtyards .